This webinar is worth 8 AMTRA CPD points and is suitable for all SQP types. Stephen Dawson will give a round-up of issues from AMTRA, including what’s new in the updated SQP Code of Practice as there are changes that affect all classes of SQP. He will also include information on the findings of the first AMTRA mystery-shopper exercise and some details of plans for the next round of mystery shopping. Other frequently asked questions of the AMTRA office will include the new farm compulsory CPD, and Brexit – what now for SQPs? This will get you 8 AMTRA points, but is subject to AMTRA accreditation. Since September 2009 Stephen has been Secretary General of AMTRA, appointed by the DEFRA Secretary of State as professional regulator for SQPs. As part of a team of four employees, plus a range of non-employees working part-time for AMTRA, he manages to do a bit of everything, from being secretary to the Board and Professional Standards Committee, through representing AMTRA on various external bodies, to being responsible for the beast that is the envelope stuffing machine. His role is to help in managing the professional training, registration and professional discipline of SQPs in a responsible and professional way as well as trying to communicate the role of SQPs in acting as animal medicines advisors, providing high quality advice and medicines. Before AMTRA he spent almost 14 years as Technical Executive at NOAH representing the animal medicine companies on technical and regulatory matters. How do you maintain your accreditation with AMTRA? As you know CPD is compulsory for all SQP’s to maintain their AMTRA accreditation, one of the easiest ways our SQP’s maintain their AMTRA accreditation is via webinars. Webinars are a cost effective accessible way for you to keep up with your accreditation, providing a high quality learning experience. Our vision at the webinar vet is to provide quality vet-led content, to create confident, highly trained SQP’s. You can purchase either a monthly or annual membership giving you access to the full library of previous webinars and automatic access to our live webinars throughout the year. 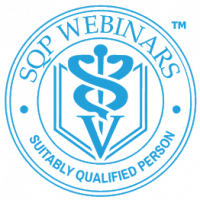 Each month we broadcast a live webinar specifically for our SQP’s, but don’t worry if you can not attend our live webinars as they are all recorded and available to watch via our website at anytime. Each of our webinars is worth 8 AMTRA points with your attendance being logged and automatically sent to AMTRA for your records.